You can almost touch it! This one's in my top 10 for sure. This has a ton of potential for lava rock and other cave formation / rock formation situations. This is a great display of the raw capability of a new tool. Way to stretch, Ryan. Disgusting to some, beautiful to others. Perfect. Keep pushing your own creative boundaries. ...but "Some things are best left at the toilet"? Really? So you didn't like it. You couldn't have put it more constructively for Ryan's sake? You are a member; he must do some renders you like. Wow. Just wow... moved immediately to one of my favorites alongside the redo of Borealis and the original Phraxis! FIY- the 5120x1440 dual 16:9 is linking to the 7680x1440 triple 16:9. Great Job Ryan, This is probably my favorite one yet! I'm a big fan of Fractals. Looks like someone has taken up some sort of freeform knitting or crochet.lol. Can't wait for the multiscreen of Octopus Garden Ryan its flawless. 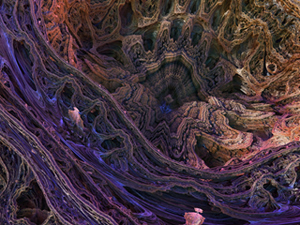 Fractals are fascinating and beautiful, and this one ranks as one of my favorite DB wallpapers. I would love to see other versions with a different color palate. Ryan, I see that one of the multiscreens is missing: "3840 x 1200 (dual 16:10)". Is this intended or an error in your PS action or something else? Here is the area I chose to zoom in on for Helios 3.
trying to figure out where it was taken from. I think I like this new version/perspective even better. Very nice! Surprised this is scoring low right now, it's immediately one of my all time favorites. Then again, I prefer the abstracts, and love the colorful stuff, so maybe just my own bias. Hey Ryan, I have been using your images as the background for my Motorola Droid for awhile now. I recently upgraded to the new Droid Razr (qHD screen 960x540). I was wondering if you could start coming out with new 1080x960 wallpapers for this phone? Possibly render some of your old images in this resolution as well? Thanks and keep up the great work. I know lots of folks like this one, but it's a little dark for me. I honestly prefer more upbeat wallpaper. Normally I love fractals.. but some how this one doesn't do it for me. Yes I hope to have the multiscreens finished soon! Will you be putting out a multi-screen version of this and Octopus Garden? Now this one is wallpaper-worthy :) The extra red and slight DOF blur does it for me. I've added one more (probably final) version this morning. I wasn't entirely comfortable with the "Sarlaac" aspect of this piece so I've moved the camera in for a tight close-up. 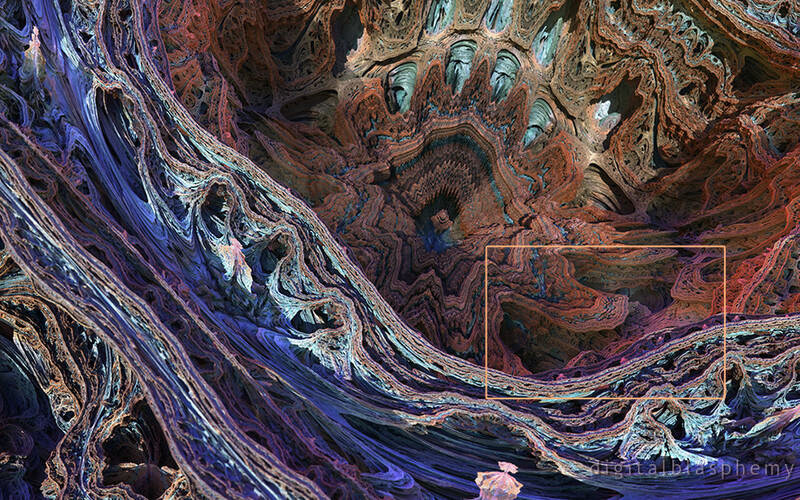 Since this is a fractal, more details become evident the closer you get. The colors in the alternate are wonderful but the main version with the light and blurring make it have so much depth I love them both. It looks like this new program is going to take your abstract work to the next level. Love the depth of Shadows and Light. Bravo! Eh...looks a bit random...but I'm looking forward to seeing what else you can do with this program. I'm not often a fan of abstracts, but this is by far my favorite work of the year! Way to go! 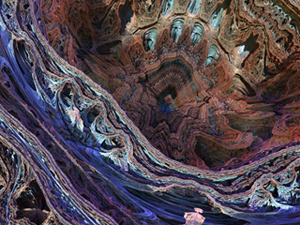 I love your abstracts, and I love fractals. Wow! staring at it makes me dizzy--not ditsy--I LOVE IT!!! I agree with Ian that it's somewhat reminiscent of a Sarlacc, except it's beautiful instead of scary. Glad you're doing fractals again, and in 3D no less. A stunning piece of work to be sure, but to me it is also somehow... frightening? Disturbing? Both perhaps. This *needs* to be an iPhone skin. Just sayin. Sorry about that. I've updated most of the files. Looks like my PS action to resize the multiscreens went haywire. Trying to focus on one area just draws my attention to another, its pretty wild. And as an amateur artist, I'm going to check out Mandlebulber myself! I say keep that machine. It performs magic. Or more correctly, Ryan, you create the magic that it produces. WOW, there just aren't enough word to glorify this piece. Way to go ... again! Cheers! This is so awesome!!! Unlike anything you've done in the past!! Good work my friend. A beautiful pandemonium... That's how I see it! Epic Ryan! This is one goes straight to favorites! Just grand!